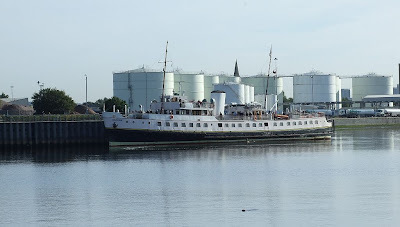 With a seal visiting the waters at the confluence of the Rivers Cart and Clyde, BALMORAL was seen this morning making a special call at Clydebank, on her sailing from her berth at the Science Centre to Lochranza. This is not the first time that she has called there, having previously visited Rothesay Dock on a special sailing in spring 1990. Nice shot John - I'll just ask you where to go next time....!